Between 1967 and 1975, the United States Air Force ordred from Ling-Temco-Vought 5 YA-7D prototype aircraft and 454 production models. Here are the known production blocks, with serial numbers and known survivors. LTV A-7D (S/N 69-6195) assigned to the USAF Test Pilot School at Edwards Air Force Base, CA. This aircraft was retired to AMARC on May 7, 1990 and sold as scrap on Jun 18, 1998. 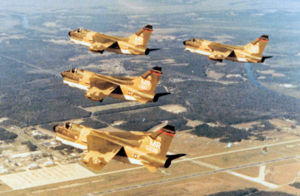 1972 Formation of LTV A-7Ds (S/N 69-6234, 70-0987, 69-6239 and 69-6235) of the 353d TFS/354th Tactical Fighter Wing, over Myrtle Beach Air Force Base, S.C.
Prototype LTV YA-7K (S/N 73-1008) of the Arizona Air National Guard, taken after the end of its service with the 4450th Tactical Group in 1989. This aircraft was sent to AMARC on Aug 3, 1992. LTV A-7D (S/N 72-188) static display at Burnet, TX. The aircraft shows the markings of the 146th Tactical Fighter Squadron, Greater Pittsburgh IAP PA which retired the aircraft to AMARC on Nov 14, 1991. 67-14583 on display at Air Force Flight Test Center Museum Airpark, Edwards AFB, CA. 69-6235 at Rickenbacker ANGB, OH. 70-0973 at Pima Air and Space Museum, Tucson, AZ. 70-1001 at Buckley AFB, Aurora, CO.
70-1039 converted to YA-7F. Now on display at Hill AFB, UT. 71-0334 mounted on display at Altoona, Iowa. 72-0175 at Tinker AFB Air Park, OK.
72-0178 at Springfield, OH airport, on ANG side. 72-0188 on display at Burnet airport in Texas. 72-0240 preserved at 45th Infantry Division Museum, Oklahoma City, OK.
72-0245 on display outside New Mexico ANG compound, Kirtland AFB, NM. 73-0996 on display at Wings over the Rockies Museum, CO.
73-1008 modified to protoype YA-7K. First flew Jan 1981. 74-1739 at South Dakota Air and Space Museum, Ellsworth AFB. 74-1746 on display at entrance to Four Corners Regional Airport, Farmington, NM. 75-0408 on display at Quonset Air Museum, Kingston, RI. No known A-7Ks were retained after their airframes were sent to the Aerospace Maintenance and Regeneration Center (AMARC). 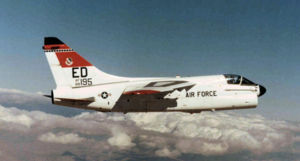 Beginning in 1990, A-7Ds began to be transferred to AMARC from Air National Guard units. 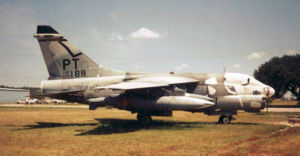 A-7Ks began to be retired in 1991. By 1993 the fleet of A-7D/Ks were off the ANG rolls. Starting in 1998 the aircraft were removed from long-term storage and processed as scrap. All were off the AMARC inventory rolls by 2000. 69-6207 (4450th TG) lost power while on cross-country flight. Pilot glided aircraft 30 mi in to Indianapolis but got bad information from ATC and came in with too steep a descent. Pilot ejected and aircraft struck a Ramada Inn at the airport, killing 9 on ground. Pilot absolved of any blame. 70-1045 (180th TFW, 112th TFS, Ohio ANG) crashed May 17, 1991 during sortie from Moody AFB, GA.
71-0310 (353d Tactical Fighter Squadron, 354th TFW) one December 2, 1972 shot down during CSAR mission in Laos (Capt Anthony Shine KIA). 72-0172 (23rd TFW, 76th TFS) crashed Aug 27, 1975 on the Eglin AFB range during night training mission. Pilot killed. 72-0173 (132nd TFW, 124th TFS, Iowa ANG) crashed Apr 4, 1989. Baugher, Joe. USAAS-USAAC-USAAF-USAF Aircraft Serial Numbers--1908 to present. Access date: 25 February 2007. This page was last edited on 5 March 2007, at 08:36.